We have state-of-the-art infrastructure that has all the required facilities and tools that helps us to check the quality of the products. We have pool of professionals who are highly experienced in this domain. We are looking for queries from Northern India majorly from Punjab, J&K, Haryana Himachal Pradesh, Rajasthan, Chandigarh, Uttarakhand & Delhi. Keeping in mind ever-evolving requirements of our respected clients, we are offering a premium quality range of Oil Free Screw Air Compressor. To retain our goodwill in clients' consideration, we are trading and supplying an excellent range of Oil Free Piston Compressors. Our expertise also lies in meeting the demands of FS-Curtis Oil Free Screw Compressors that produce totally Oil-Less air with water injected compression process that makes it completely free of any hydrocarbons. Being highly efficient, fixed speed models, these deliver up to 15% energy savings over dry screw type compressors. Rugged construction of our Oil-Free Air Compressor assures the low maintenance cost. 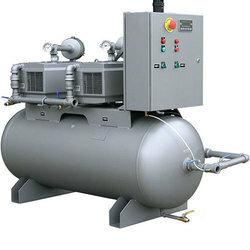 Easy to install, our Oil-Free Air Compressor is perfect for various industries. We stand among the dominant Oil Free Screw Compressors Manufacturers in India. The centrifugal compressor is a dynamic compressor. Which depends on transfer of energy from a rotating impeller to the air.